Having trouble separating your scops from your screech owls, Tengmalm's from Tawny Owl or Collared and Spotted Owlets? Then this is the book for you. Owls of the World is the ultimate photographic resource dedicated to the identification of these charismatic, largely nocturnal birds of prey. 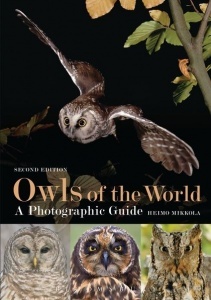 This book contains lavish and spectacular photography from dozens of the world's finest natural history photographers, covering all of the world's 268 species of owls; particular attention is given to subspecific differences, sexing and ageing. The photos are accompanied by concise text on the identification, habitat, food, distribution and voice of these birds, along with accurate range maps. In this second edition, recent changes to owl taxonomy are incorporated with full descriptions (and images) of a number of new species, plus a several new photographs to improve this book's amazing photographic coverage still further. This is the definitive work on owl identification – no birder's bookshelf should be without it!